Type some words or phrases in the search box, Google Drive shows the search result. Locate the one we are interested. As usually we put all related resource in one folder, it's very likely we want to go to that folder to check all files in that folder. When we select the one(Notes on Hadoop.doc in this case), GDrive would show a Detail View in the right side. If it's not shown, click the "Details and Activity" button on the right top side, or use shortcut key: d.
Go to the folder section, click on the folder name(hadoop in this case), this will take us to that folder. In the search result, it shows folder name after the file name. 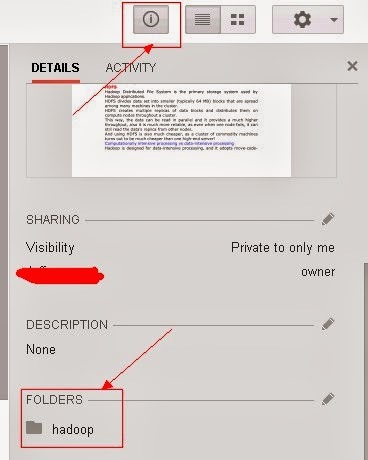 A better way to navigate to the folder is to make the folder clickable. Clicking the folder name would take us to the folder.